The Australian Online Apple Store is showing an "Interested in buying in-store?" 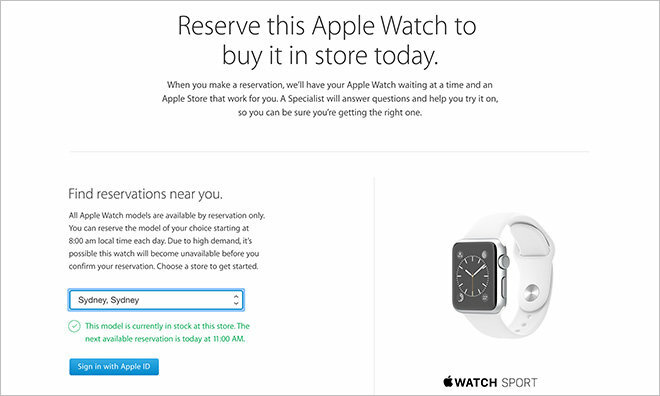 link that routes to a "Reserve and Pick Up" page for Apple Watch orders. Selecting the option allows potential buyers to schedule a purchase appointment at a brick-and-mortar store, the first instance of official Apple Store availability since Watch debuted in April. The process requires buyers enter an Australia-based phone number to which a unique registration is sent. Upon receiving Apple's text, customers have 30 minutes to reserve a pickup time before the code expires. Only select models are available at this time, with more common Sport and stainless steel models turning up as in stock at many locations. Hard to get versions like the Space Black stainless steel Apple Watch and all Apple Watch Edition iterations are still limited to online purchases. The UK Online Apple Store is showing an identical reserve and pick up webpage, but the buying option is set to go live at 6 a.m. local time. Earlier this month, Apple released a statement regarding Apple Watch availability, saying retail store sales would begin on June 26, though it seems that timeline has been accelerated in certain regions. That same day marks an expansion of sales to Italy, Mexico, Singapore, South Korea, Spain, Switzerland and Taiwan. Apple is expected to expand in-store Apple Watch order fulfillment at more locations as stock levels rise, meaning a U.S. launch could come as soon as tomorrow.